Thirteen universities entered. Some universities entered a large number of teams. Eventually the following number of teams took part. The Heats were not without drama. • UCT had a power failure and the UCT teams travelled to the UWC to participate. • Some universities did not print out the usernames and passwords and teams had trouble logging in. For questions from the Heats see Past Papers. For some universities this was the only question they had correct. For the organisers it created a problem in that all eleven teams wanted to submit immediately when the contest started. The theme for 2013 was “Standard Bank is going green!” to celebrate the new Standard Bank HQ building which was designed to be “green” (environmentally friendly and energy efficient). No 2 and No 1 team BOTH solved 7 problems i.e. all the problems. When this happens the winning team is chosen on time. The timing is complicated because there is a penalty every time a team submits an incorrect solution. 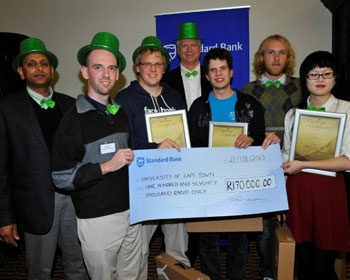 Nine university teams and two Standard Bank teams participated in the finals. The eleven teams submitted 90 solutions and not a single one had a compilation error!